Thursday, December 1, 2011 - Springfield, Oregon - SmartCAMcnc has announced the release of SmartCAM® V18.5. Version 18.5 delivers new and improved functionality to the SmartCAM turning and milling suite of products, and several core usability enhancements to the entire SmartCAM suite of computer-aided manufacturing (CAM) system software. The SmartCAM product family consists of applications for Computer-Numerical Control (CNC) milling, turning, fabrication and wire EDM. 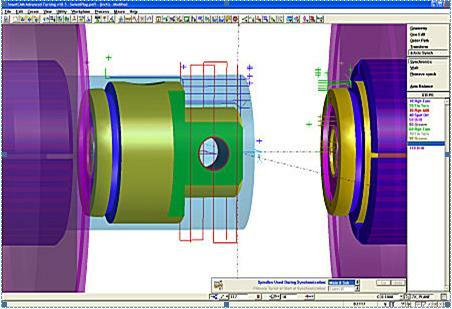 SmartCAM Version 18.5 was built on three central themes: turning and mill/turn improvements; mill roughing improvements; and core usability enhancements requested by customers. Sub-spindle support is introduced to the SmartCAM Advanced Turning™ product, and is one of three major turning improvements in V18.5. It allows machining operations to be defined on workplanes designated for the sub-spindle. SmartCAM toolpath generation routines now allow toolpath to be created using main- or sub-spindle plane orientations, and a sub-spindle offset parameter allows the sub-spindle origin to be offset from the main-spindle origin by a specified distance. Turret synchronization now allows turning operations to be synchronized across spindles, and new code generator template words provide support for independent spindle control, and conditional sub-spindle output. B-axis Indexing Support is the second major turning improvement added to SmartCAM Advanced Turning. It allows live tools on machines with a pivoting B-axis to be positioned to machine on the face or side of a part, as well as on skewed planes. The Show Path and ShowCut toolpath and material removal verifications have been enhanced to display the tool pivoting into position, providing a more accurate and realistic representation of the machine movement, and the Code Generation module has been enhanced to output the corresponding B-axis positions and commands. The third significant turning improvement, Live Tool C-Axis Face Indexing, is found in SmartCAM Advanced Turning. The C-axis indexing capabilities of Advanced Turning have been extended to include the ability to index user defined workplanes whose local Z axis is parallel to the world Z axis. This new capability allows machines with a Y axis to machine repetitive face features by indexing the C axis to each feature position then using XY motion to cut the feature. The final major turning improvement, Canned-cycle Roughing Support, is found in both SmartCAM Production Turning and SmartCAM Advanced Turning. This new support takes advantage of a machine control’s built-in roughing cycles by outputting the necessary canned-cycle commands and part profiles, while still providing in-SmartCAM verification that accurately simulates the material removal. Also in V18.5, all SmartCAM milling products provide a new Rough Milling Morph Pattern which allows a variety of pocket and face features to be machined with a continuous toolpath that blends between an outer boundary and an inner point or island. This new pattern type ensures the specified cut type (climb or conventional) is consistently maintained throughout the entire toolpath while eliminating retracts and re-entries which can often lead to reduced feedrates and tool breakage. The Advanced Milling products (Advanced Milling and FreeForm Machining) include a new Closed Profiles Planar Rough Process option that provides further control by allowing machining to be restricted to closed areas only. As with all SmartCAM releases, numerous customer-requested core usability improvements can be found in all SmartCAM V18.5 applications. Improved workplane definitions, a new right-mouse button menu for instant access to workplane commands, an improved Element Data command which allows elements inside a Container to be viewed, and new viewing controls that allow standard views to be displayed relative to any workplane were all suggested by SmartCAM customers. The SmartCAM family of computer-aided manufacturing software provides toolpath modeling and CNC programming for prismatic production work to complex molds, dies, and prototypes to an established customer base of over 12,000 companies in 67 countries. SmartCAMcnc provides affordable maintenance contracts, updates, upgrades and technical support for all SmartCAM users, regardless of version. All SmartCAM products include updated data translators and market-leading NC editing software from Predator Software, Inc (www.predator-software.com). SmartCAMcnc is an Oregon-based company that was established in December 2003 for the purpose of reviving the SmartCAM suite of computer-aided manufacturing (CAM) software for the benefit of its worldwide customer base. Gregg Olson, founder and president of SmartCAMcnc, has been involved in developing CNC programming systems since 1979, with over two decades of experience in various product development capacities for Weber Systems, Point Control, CAMAX, and SDRC. Antech Micro systems is Pune based company is engaged in CAD CAM DNC and Machine monitoring software from last 20 years. It has more than 2100 installations in India. Antech supports it’s customers with their team of 50 plus engineers and Reseller partners in India and abroad. It also has state of art vocational training institutes in CAD CAM CNC with Production CNC machines for practical exposure to CNC. It also runs free training programs on CNC as well for needy.